This second edition of a popular textbook is thoroughly revised with around 25% new and updated content. 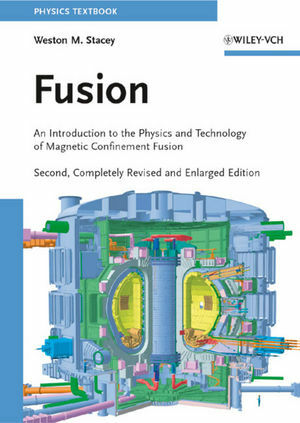 It provides an introduction to both plasma physics and fusion technology at a level that can be understood by advanced undergraduates and graduate students in the physical sciences and related engineering disciplines. As such, the contents cover various plasma confinement concepts, the support technologies needed to confine the plasma, and the designs of ITER as well as future fusion reactors. With end of chapter problems for use in courses. Weston M. Stacey is Professor of Nuclear Engineering at the Georgia Institute of Technology. His career spans more than 40 years of research and teaching in nuclear reactor physics, fusion plasma physics and fusion and fission reactor conceptual design. He led the IAEA INTOR Workshop (1979-88) that led to the present ITER project, for which he was awarded the US Department of Energy Distinguished Associate Award and two Department of Energy Certificates of Appreciation. Professor Stacey is a Fellow of the American Nuclear Society and of the American Physical Society. He is the recipient of several prizes, among them the American Nuclear Society Seaborg Medal for Nuclear Research and the Wigner Reactor Physics Award, and the author of six previous books and numerous research papers.